Double Eviction and the Carrot and the chef have left the building! An explosive show on Thursday began with the gathering of the house-guests, and the announcement of the show’s surprise double eviction ( the second of the season!) as it stood with Ian as reigning Head of Household his nominations were made and Joe and Frank sat on the block waiting for their fate. Frank and Joe sit on the block for the first of two eviction in the second double eviction week on Big Brother 14. 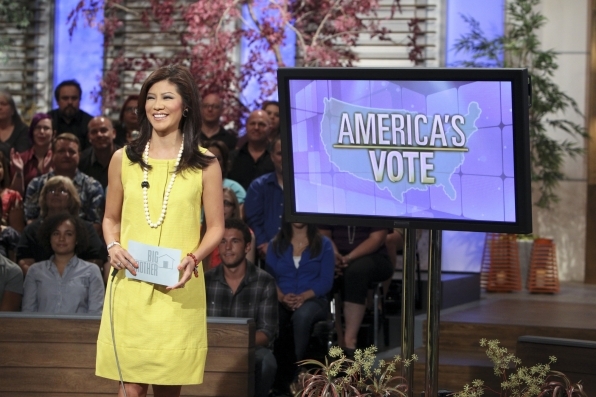 When Julie Chen announced to the house guests that this week would also be a double eviction I was surprised not to see more scrambling for last second votes. I think it was really because Frank was under the impression that he was safe this week, due to Dan’s very effective plan of ruthless lying. There is some great controversy growing over this and Dan’s choice of “swears” on his Bible. Dan has made it quite clear in his publicly aired Diary Room sessions that he is willing to tell lies in order to support his family and would continue to do so for the win. As in all seasons of Big Brother, each player makes choices based on their own belief systems, but really should consider how each “move” or “lie” could affect them after the game. I always hope that viewers will understand the spirit of the game, and when it’s over, will remember that each and every house-guest is a player in a game and half the fun is the drama. When all was said and all votes were cast, Frank was evicted from the house, by a vote of 3-1 and left only hugging his ally Jenn who had cast the one vote for him to remain. Frank will join, Britney and Ashley in the Jury house in sequester for the finale show. I personally was not sad to see Frank go. His 9 lives were well used up and his live feed personality was quite different from the one edited for the CBS shows. After the eviction, the house-guests immediately sprang into action for the double eviction. For the HOH competition, everyone moved into the back yard and took their positions for a quiz type competition. The contest is a “quiz” type and Julie reads quotes from evicted HGs and the players need to identify who said it. Whoever gets the most right in seven questions wins the contest and the coveted HOH. After a series of questions, there is a three-way tie with Jenn, Dan and Danielle, so it goes to a tie-breaker question and DAN is declared the winner! Its time for the nominations and before Dan even has a chance to name the HG’, Joe takes a seat in the nomination chair. This somewhat breaks the tension then in a somewhat shocking maneuver, Dan officially nominates Joe and Ian for eviction, marking the first time Ian has been nominated all season. This also marked the fifth time Joe has been nominated. 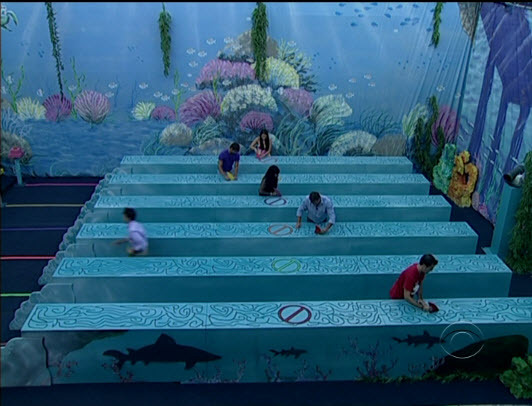 Next is the power of veto competition, and to guarantee safety, the HG’s must work a plastic type shark fin through a massive maze, remove it and run back to the button hit it to win. It’s a close race, except for Shane who never seems to get out of the starting gate with his fin. Ian quickly moves his fin through the maze and while the others are still struggling Ian smacks his button for the win! IAN WINS THE POWER OF VETO! Ian uses the power of veto and saves himself, of course. Dan nominates Danielle which is a shock to her, but she takes Dan at his word (which is not golden, as we know) and only over-reacts slightly. Obviously Dan wants Joe out, and he was worried that if he nominated Jenn, everyone would’ve voted her out. Dan is playing with fire right now, but this is probably the smartest move to get his way because there’s NO WAY Shane and Jenn will vote out Danielle. But still, Dan literally just nominated two people he has Final 2 deals with. The gasp from the audience when he did it was priceless. JOE IS EVICTED 3-0 and its the first unanimous vote of the season. Joe is a very good sport, as he’s the most excited person walking out the door all season. Joe talks with Julie and blames the “showmance” for him getting evicted, making jokes about how he couldn’t offer Shane the same things Danielle did. He also claims his “strategy” was to lose competitions on purpose. We say goodbye to Joe with a hearty THANK YOU for all the cooking and recipe sharing he did with the live feed watchers and Slop Du Jour this year! Goodbye Chef Joe!!! Good Luck with MadLoveCooking and you will always have a friend at Slop Du Jour! Britney warmly greets the crowd, pretty in pink. Its true, Britney has left the Big Brother house. By a vote of 5-1 the house guests chose to send the 3rd coach packing, however this time the bag was packed for the second member of the Jury. Britney was a tough player this year, and even having Willie (who was expelled by BB for breaking violence rules, back week 2) as a team member managed to survive until all but one of her players was gone. She will be missed, as the last 7 members of the house lack the normal “spirit” that people like Britney bring to the house. As America’s favorite house guest in the past, she has a chance to again take home the $25,000 cash prize! Stay tuned and vote for your favorites! The Big Brother Sun, with all its little satellites! 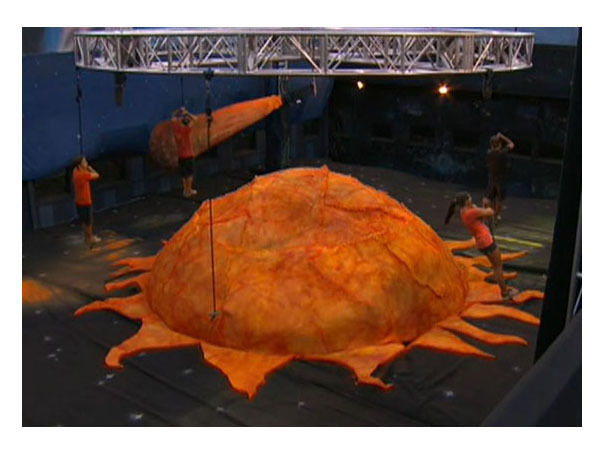 After the eviction, the House guests went straight to an endurance competition called “Around the Sun” in which the players had to stand feet on a round (very small) disc hanging from long ropes, and be swung around while hanging on and staying on for the longest. The sun of course sprayed them with “tanning” spray and later a “comet” that looked more like a caveman club to me, would pummel and twist the competing house guests. America tweeted out to CBS during the live show, and the first house guest to be eliminated from the competition would be given (based on the viewer vote) either a punishment or a reward. America decided to levy punishment on Joe, who fell from the ropes after only two minutes (on a personal note, this was before the live broadcast had even ended, Jenn was soon to follow. Joe was punished with 24 hours of hula hoop boot camp (he had to get up and hula hoop whenever a song comes on for the next 24 hours). The contest came down to Shane and Ian, ( it was pretty obvious that Ian had the right stuff to win) and Shane’s muscles could not hold out and he made a deal with Ian for safety for the week and dropped. Jessie in the house turns everyone into the GRINCH! Pandora’s Box was offered to Ian, and after seeing a Christmas tree with presents under it, he accepted and opened the door to find many fun cute toy type gifts ( which are perfect for Ian, and he loved them all) and $1000 in cash ( of which he did not mention to the other house guests). As with all Pandora’s box’s, there is something unleashed ( good or bad) on the house. 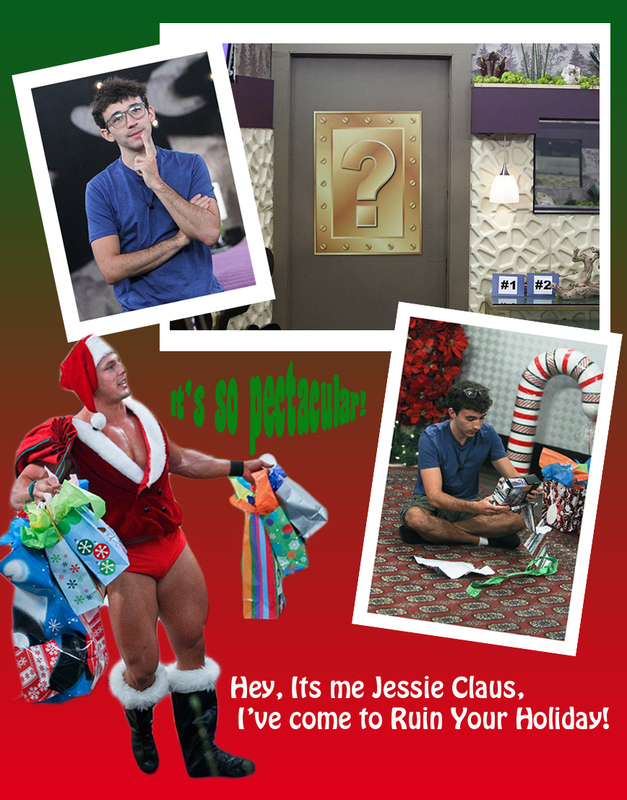 Jessie Claus ( Jessie is a notoriously disliked past house guest) and his return to the house was definitely a negative. Jessie took all the “unhealthy” food out of the house, and replaced it with his idea of healthy food. The house guests were not happy with the visitor nor with his presents, but played along like good sports. It seems this week instead of have-nots, we have a house full of health nuts! At the nomination ceremony Ian gave easily the best nomination speech of the season. He was frank (pun intended) and honest, and he spoke with the most confidence I have seen from him all season. He even looked both Frank and Jenn in the eyes when he was taking to them, which hasn’t been done a lot at the nomination ceremonies this year. Here’s what he told Frank and Jenn when their keys were not pulled from the box, “Frank, you are a phenomenal competitor in this game. And I downright respect you for it, but you’re a huge threat and that is definitely an issue I have to look at going down the line. Jenn, you have played a remarkable social game so far and you’re also a threat. And I just have to keep these types of considerations in mind when moving forward and nothing personal, just strategy. Because Julie Chen announced it to the viewers, we are expecting a double Eviction this Thursday. The house guests are not expecting it, but have an idea another double eviction or a fast forward might be coming and have been running around making final 3 and 2 deals with each other. Everyone seems to have more than one deal, and this weeks nominations are no exception. 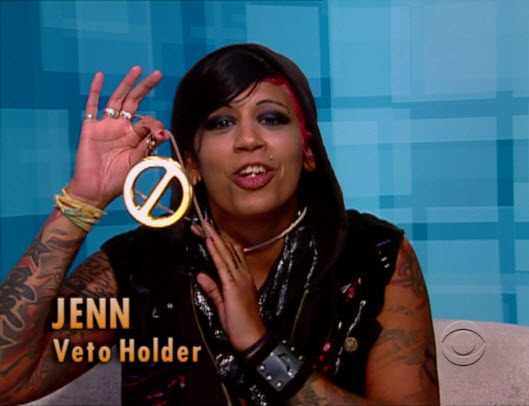 Tune in for tonight’s show to see who will win power of Veto, and possibly save Jenn or Frank from eviction. See who will be put up on the block if the power of Veto is used tonight at 9:00/8:00 Central on CBS! The Power of veto competition players are drawn and Ian is picked to be the host. The veto players are picked, and the battle lines drawn. It’s veto competition time, and the contest is called “Draw Something”. This competition is a contest of wills and visual puzzle solving. These puzzles once solved allowed the house-guests to perform a punishment, receive points or decline and be eliminated from the game. Frank takes on points and punishments as he takes a dip in an avocado bath, accepts a chum bath once an hour for 24 hours, and wears a carrot costume for a week! Frank also accepts 1 week of non-eligibility for HOH (this would mean two weeks for Frank because his is not eligible in the next HOH competition. A chum bath looks as bad as it sounds. Punishment Paint is hurled onto Danielle, and she is in the race. Dan eats some Big Brother “food” (somewhat gross things) and is a close second in the scoring. After Dan accepts 24 hours of solitary dance party confinement, the scores are very close. Danielle gets pelted with paint, that later gave her a throat irritation! Frank mumbles “summer” to Britney and gets disqualified for breaking the rule of not giving away aid to other house guests. Frank’s punishments stand with no chance of him gaining the Power of Veto. Jenn is victorious (by default) and takes slop for the rest of the summer for the win and the power of veto. Dan is overcome with emotion at the loss, and quickly enters his solitary punishment. Britney and Danielle enjoy their time when they are chained together for 24 hours as a punishment of the veto competition. After Dan’s 24 hour solitary confinement, he fakes a sort of panic attack and gains some sympathy from the house-guests in the form of concern for his health. Dan requests a house meeting, saying that he has some things to say. He addresses the house as if he has remorse, and says good things about everyone, and many tears are shed. Danielle is the last person to be addressed by Dan, and he says she is dead to him in this game. Danielle reacts very poorly, and is devastated by Dan’s remarks. He later clues her in on the plan.. she is not amused, but hopeful. House meetings always end up with big changes in the house! Dan requests a meeting with Frank during his “funeral” and comes clean with him and tells him it’s a plan to save him and make new alliances. Frank buys in, and joins Dan in a final 2 deal with a handshake. Dan comes clean with Frank, and makes a final 2 deal with a handshake, a swear on the bible, and his wedding ring. During the Power of Veto ceremony, Ian first chooses not to use his golden power-ball veto. Jenn then steps up and to amazed, astonished and open-mouthed house-guests, takes Dan off the block and replaces him with Brittney. Brit and Dani are on the block.. much to Brit’s dismay! Who will be eliminated on the Live Show tonight! Be sure to tune in to CBS!!! America Choice is…. Drum roll Please! CLICK HERE TO WATCH THE REVEAL! Dan was picked to be the have not of the week ( Dan has never been a have not in all his time in the BB house) and Jenn has actually accepted the role of have not for the rest of the summer (Spoiler keeps me from telling you how that happened). She is not allowed to have the added bonus foods, so her time in the BB house is going to be tough! Mozzarella and Matzo is a pretty interesting choice and opens up all kinds of possibilities. Yesterday was a pretty tense day in the house ( as you live feed watchers know), and even with the crazy tension and “day drinking” that Ian and Frank did, Joe still came through and made some pretty incredible cheese sticks! Yummy and delicious, Dan has it made with America’s Choice! Mix the slop, crackers, garlic salt , cornstarch and pepper in a medium bowl. 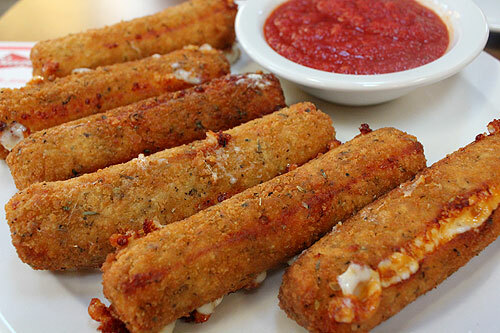 One at a time, coat each mozzarella stick in the mixture, into the oil. Fry until golden brown, about 30 seconds. Remove from heat and drain on paper towels. balsamic vinegar, olive oil, red wine vinegar, rice vinegar, vegetable oil, hot sauce, ketchup, BBQ sauce, mayonnaise, mustard, pickles, relish, salsa, soy sauce, steak sauce, Worcestershire sauce, honey, black pepper, garlic salt, crushed red pepper, salt, vanilla, basil, bay leaves, cinnamon, leaf oregano, paprika, parsley, rosemary, brown sugar, artificial sweetener, powdered creamers, white sugar, tea and protein powder. Mix all ingredients thoroughly and serve! Stay tuned for more of what’s happening in the Big Brother house and for what the have nots as well as the house guest are eating! Boogie and Jenn sit on the block, waiting for the eviction.. the first of two! It was an amazing and action packed night in the Big Brother 14 house last night. The Live show on CBS packed a double eviction into one hour-long episode of drama! As the show began Mike “Boogie” sat on the block with Jenn who had been named as a replacement for power player Frank who once again had won The Power of Veto and removed himself from the chopping block. It was Jenn’s first time on the block and she showed her anger towards her nominator Shane, and everyone else who she assumed wanted her on the block. She was naturally a complete and total pawn, and had no chance of being evicted in the first round. The final votes were cast quickly, and Boogie was evicted by a vote of 6-2 (note: you could just see the shock on his face as he heard the number of votes, because it did not add up with what he expected) with Joe, Ian, Brittney, Dan Shane and Danielle casting the votes to evict. 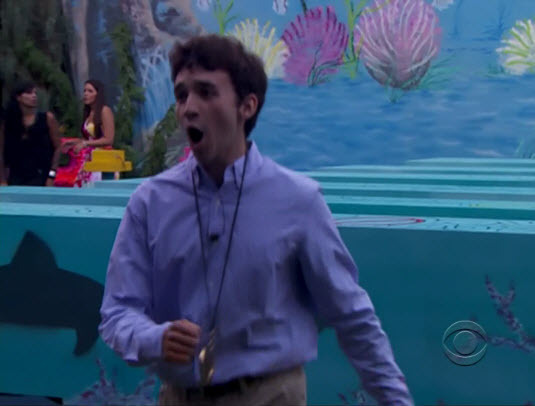 The before or after is one of Ian’s best chances at HOH! The HOH competition, which was a before or after trivia questions about things that have gone on in the house since day 1, was then played by all the remaining house-guests except for the outgoing head of household Shane. It was a tight competition but in the end the expected winner was Ian for the HOH win! Ian quickly had a few conversations, asked for a few promises and nominated Frank and Ashley for eviction. Next the Power of Veto competition was held, and it was a physical competition. Each house-guest was given a lane with a ball pit full of little yellow balls filling it to the top. Buried in each of these pits were two clovers. Each contestant was to run to the pit, retrieve the clovers (one at a time) and bring them back to the starting line. 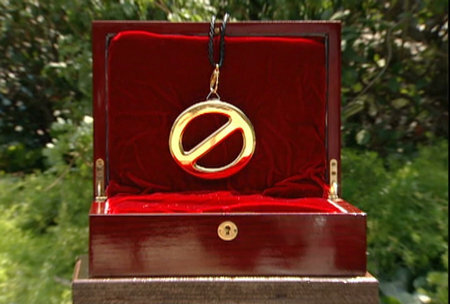 After the clovers were found and delivered, the power of veto replica was to be retrieved and brought back to the goal line and the button pressed. Frank pulled this win out to save himself from eviction. The House guests all put there best foot forward to win the POV! At this time Ian (HOH) had to name a replacement nominee. Ashley was placed on the block along side Joe. Ashley really seemed pretty confused and possibly drugged ( she has been taking pain pills and talking about it since day 1 in the house) and gave a pretty jumbled plea to stay in the house. Joe was breathing quite heavily from either excitement or exhaustion and gave his speech in a non-verbal, gestures manner. It was quite clear, effective and to the point and by a vote of 5-1 Ashley was evicted from the Big Brother House. The 2nd HOH competition of the night was held in the house a couple of hours after the live show and the results are astonishing! So be sure to stay tuned for what happens and how it will affect the house! Tune in to CBS on Sunday for the show, check your local listings for times! The big brother contestants have it smooth and easy this week, or do they? There was no have not competition this week so everyone has had a chance to rebuild their stamina and get creative in the kitchen. Joe is the man (check out his facebook @MadloveCooking), and created a couple of treats for the other house guests over the last few weeks and because everyone raved so much, we’re going to bring you those recipes here! Joe has made a couple of Avocado Cheesecakes and from what I hear, this is an amazing dish that has lots of flavor and good healthy proteins! Pre-heat the oven to 300 degrees. Put almonds into chopper and pulse until finely chopped. Add graham cracker crumbs, sugar, and melted butter, and pulse until just blended. Press crumb mixture into the bottom of a 9 inch spring form pan. Set aside. Before starting your cream cheese mixture, allow all ingredients to reach room temperature. Letting the cream cheese, eggs, and sour cream reach room temperature will help the cheesecake from cracking. In a mixer combine cream cheese and sugar, and blend until smooth. Add eggs one at a time until they are incorporated into the batter. Place avocados into a food processor, and pulse until they are smooth, add lime zest, lime juice and sour cream, and pulse until you have a uniform mixture, add the avocado mixture into the cream cheese, and mix well. Pour into spring form pan. Bake for 45 minutes, check to see if the cheesecake is set, it should still have a small jiggle in the middle when you bump the pan. Remove from oven, and cool completely on a rack. Chill overnight in the refrigerator. Other than a good deal of Fruit Loops, and boxed calories the house guests have been eating Joe’s cooking. Oh Joe… gotta wash those hands! One of the favorites is Chips and guacamole. While I did not catch Franks recipe on the show (gotta love BB fish!) I do have a fantastic recipe for it, and I’ll share it with you! Take all ingredients and place in a bowl unmixed. Using two large spoons, begin slowly mixing by making a cutting type motion with both spoons (as if you were using a knife and fork to cut meat) and keep smashing the avocados with the spoons, keep it moving until a nice green “paste” has formed and all ingredients seem to be mixed well. Chill for about an hour and serve with white corn tortilla chips. Happy Crunching! Stay Tuned for more action from the BB house. Things on the feeds are hot hot hot, and this weeks live show on Wednesday at 8:00PM on CBS! The Have Have-Not Competition is Sour Citrus! 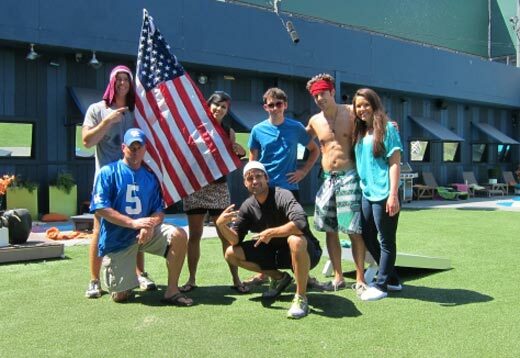 The BB 14 House guests are suited up and ready for squeezing. The Have/Have Not competition was rough going this week. All of the HG’s were able to participate expect for Ashley who has had some major back problems flare up (she seems to have recovered quickly)and she was able to choose to compete as shadow player of Franks in the Lemons and Lime Juicing competition. I’m not quite sure how that was decided, but I imagine it was by drawing. Anyway, the idea is to dip yourself in the pool of juice, and soak up as much as you can into your Lemon or Lime themed sponge, run over to the juicing station and be juiced by your fellow citrus teammates, one member of the team was also a farmer, and they were to change the hoses that collected the juices squeezed out of the sponge suits. Joe gets squeezed of his juices by Frank. Joe, even when on the block, seemed to be hanging out in the “juice” a good long time, while the others jumped on each other as if they were trying to break the Guinness Book of World Records number for the largest glass of lemon-aid ever! The efforts paid off for team Lemon and the have-nots were doomed to a week of slop and America’s choice of two food items. America voted and picked Candy Canes and Cod! Many flavors were given including Cherry, Strawberry and Butterscotch! 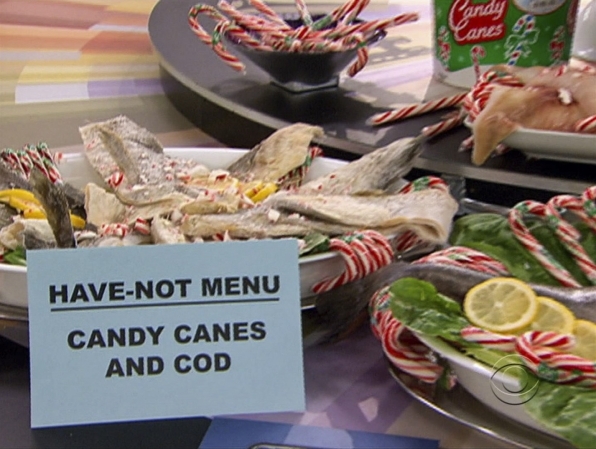 America was pretty kind and voted for the Cod and Candy Canes, and Big Brother even gave them a multitude of flavors to work with. House guest Joe is a chef and is a chef in his home life. of the have-nots so we should be in for some creative treats this week! Stay Tuned for more updates as they happen! Janelle has been evicted. Very sad to a Big Brother long time viewer as Jedi Janie was one of the best players (In my humble opinion) to ever grace the BB house. Janelle uses her beauty, brains and brawn to play the most complex social and physical game and has come so close to the win, but never quite makes it. This year, she did not even make the jury. It is (I guess) some concession that she entered the house as a coach and was only looking to take the $100,000 prize this time around, but got pulled into the game when 3 of the 4 coaches elected to join the game last week. I am sure my theory of, did not expect it anyway, will not ease her frustration of being foiled by BB again. Goodbye Jedi Janie, you are a great player, and a contender for America’s Favorite player on Finale night! Minneapolis is lucky to have you! Frank and Britney battle for the HOH in the Final question of the competition. The HOH competition took place after Janelle’s blind side eviction, and was a competition of knowledge, quick thinking and being able to put two and two together real fast. The questions were descriptions of either, VETO, HOH or from a coaches competition. Britney put up a good fight, but in the end lost to Frank, and he became HOH for the second time this season. The Nominations have taken place and Joe and Will are once again on the block for elimination. Stay tuned to see what happens next in the BB house. Stay tuned for the nominations and results of the have, have not competition! Press the button and begin again…Welcome to Big Brother 14! Going into Thursday nights live eviction show, it had been a 1 in 7 chance for the house-guests to win a half a million dollars. Now its back to a mere 1 in 12 shot at the coveted prize. How did this all happen in 15 minutes into the live show? It is Big Brother and expect the unexpected is the key to the game. During the live show and because of America’s vote, the coach’s were given the choice to get back in the game or remain coaches. If any one coach depressed the plunger the scheduled eviction of either Frank or Joe would be cancelled, and the game re-set and all 12 house guests would become equal players. All the coach’s accepted except for Boogie, and the eviction was cancelled. This means a total re-set back to 12 players, and a new start to the Big Brother 14 season. 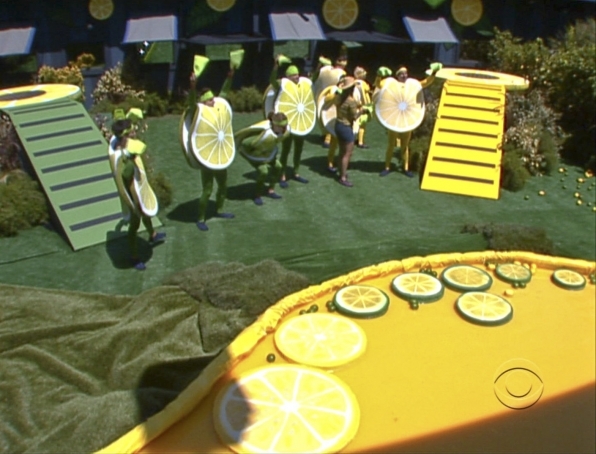 Because of the oddity of the twist, all house guests were allowed to compete in the “Walk the Plank” competition for HOH, which was an endurance contest in which each house guest perched on a plank on the BB ship and moves and water is dumped on them and they are occasionally splattered with seagull droppings. The house guests compete in HOH for control over who is nominated for eviction. Right before the competition started Dan told Boogie that without the twist Frank would have gone home. This is shocking news for Boogie because it is known to him that certain people (Wil and Danielle) have been lying to him for the last week. A win for Boogie is huge if he wants to stay in the house. Standing on a small wooden plank while holding onto a metal bar, it seems obvious that this competition is geared toward smaller petite individuals. It was at about 1 hour that people started falling (maybe jumping) off. The First was Boogie, followed by Jenn and Joe around the 70 minute mark. Ashley fell off 40 minutes later, followed by Dan. Shane, Wil, Janelle, Brittany, Ian, Danielle and Frank still hung on and were giving their all to win HOH. It is really everyone vs. Frank because a Frank win means a Boogie win. Frank falls off and everyone seems relieved. Wil and Shane decide to jump off together (although Shane hesitated just slightly at 3!) leaving Janelle, Brittany, Ian and Danielle left in the competition. The final 3 are Ian, Danielle and Brittany with Danielle appearing rock solid. Ian starts to make a deal with Danielle and this upsets Dan. Dan puts on his coaching hat and gives a great motivational speech to his solo player, Danielle. Boogie and Frank go off into the house and leave Ian hanging on the wall all by himself . Ian with his last bits of strength held on to make a deal to protect himself this week. Brittany then asked Danielle for safety which she offered quickly and Danielle became the first female HOH of season 14. In honor of this weeks lack of have-nots, and famous BB twist, I’m going to share with you readers my favorite recipe for Knotted Pretzels! If the house guests were have nots this week, they could surely make this to help ease house boredom. You can make it for a snack while you indulge in the feeds! Happy BB viewing! Stay tuned for more Slop Du Jour and news on what’s cooking in the Big Brother 14 house! Make any shape you can think up, just remember to follow the directions! In the bowl of a stand mixer, combine yeast, sugar, salt and water. Stir until yeast is dissolved. Using the dough hook attachment, add melted butter and flour and knead/mix until the dough comes together and pulls cleanly away from the sides of the bowl. If dough continues to stick, add flour 1 teaspoon at a time until dough becomes smooth. Once dough is smooth, knead with dough hook on medium-low speed for about 5 minutes. Form dough into a ball and place in a large bowl sprayed with cooking spray. Cover with plastic wrap and place in a warm spot to rise for about 1 hour or until doubled in bulk. Line two cooking sheets with parchment paper or silpat mat and set aside (near stovetop…this is where you’ll place the pretzels immediately after boiling. Bring 10 cups of water to a boil in a large stock pan, and add 2/3 cups of baking soda. Reduce heat to maintain a low simmering boil. Flour a working surface, then separate dough into eight equal sized balls. Roll each ball into 22-inch long strips. Form each strip into a pretzel shape. Pre-heat oven to 450 degrees F.
Working one at a time, drop pretzels carefully into boiling water. Allow to boil for 30 seconds. Remove from water using a large slotted spoon and place onto parchment covered cooking sheet. Repeat with remaining pretzels. In a small bowl, whisk together 1 egg yolk and 1 Tablespoon of water. Use a pastry brush to brush boiled pretzels with the egg wash. Bake for 12-15 minutes or until dark golden brown. Remove from oven and move pretzels to a wire rack. 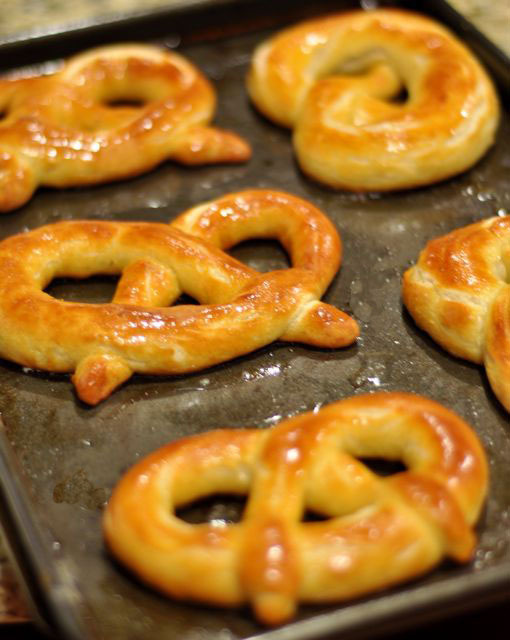 Melt 4 Tablespoons of unsalted butter and liberally brush each pretzel with butter, then sprinkle with salt. Be sure to check out and REGISTER for Fantapper.com to find more photos, recipes and more of everything you love! CHECK IT OUT! Welcome to SLOP DU JOUR! The first week in the house is always a time of adjustment for the house-guests, and the feed watchers alike. We get used to tuning in and re-working our schedules to fit “feed watching” in, and they adjust to doing much of nothing but talking game and watching their backs. Staying in the house is the name of the game, and in order to stay, your social game must be just a good as your voting game. The traditional huge table is set and ready for a season of culinary and slop delights! Again this year we see the return of “have-nots”, slop and cold showers! This year, each week the “have not” houseguests are to sleep in the “have-not” room, eat nothing but slop (and protein drink) and the chosen condiment extras. “Have not’s” are picked by the coaches competition held at the beginning of the long Big Brother week. This week (week 1) Boogie picked Ian, Janelle picked Ashley, Brittney picked Shane and Dan picked Danielle to consume and live as “have not’s”. The have not room is especially bad and filled with the un-comforts of home. Spirals and slanted beds are going to be the least desired of BB14! As of yet we have seen no America’s choice, (America votes on a combo of foods such as Jerky and Jellybeans or or but I am excited to see what HG Joe (who is a chef) will create and if filling the bellies of the HG’s will affect his game. His first creations have consisted of Slop burgers ( which have gotten rave reviews). Stay tuned to see if more creations will fill the bellies of the have nots! Danielle eyes the slop burgers with a bit of a sneer. Her attitude had better change quick or maybe Joe will no longer create such treats! The other house-guests dined on dirty Rice. I’m not sure how well it was received because there was a whole lot left over! Boogie, Dan and Jenn eat together like family. Brittney has had seemingly no problem adjusting back to the grub in the BB14 house. Everyone getting along pretty well, considering! Check out more screen-caps and join in the discussion on FANTAPPER!